LONDON, UNITED KINGDOM, July 18, 2018 /EINPresswire.com/ — Growing launch capability remains critical to continue delivering effective communications in the era of small satellites within the increasingly congested 4th domain. With the UK leading in small satellite sector, growing emphasis is being placed on new launch sites, this is evidenced by recent announcements for new funding for a spaceport in Scotland and Cornwall Spaceport’s collaboration with Virgin Orbit to deliver horizontal launch capacity in the South of England. Mr Miles Carden, Director at Spaceport Cornwall with be presenting on: ‘Building ‘End to End’ Launch Capability for the UK’. Covering: an introduction to the Cornwall Newquay spaceport proposal and its role within the wider UK space industry framework, delivering the ability to launch suborbital vehicles and satellite systems from British soil – key approaches and considerations, how the UK Space Industry Act is future proofing the nations status as a major global space plater, building relations with leading industry stakeholders to streamline launch capability, and balancing clear and segregated airspace with connections to space gateways. 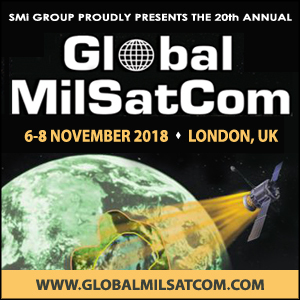 The full focus day agenda will boast high level presentations on: the next generation of launch capability, research and development of small, cube, micro and nano-satellites, how military agencies and industry are collaborating in this new era of SATCOM and more. This year’s focus day will be an unmissable introduction to the evolution of new space technologies and is set to become a key calendar date for anyone in the satellite communications sector. A brochure is available to download from the event website which details the full programme and speaker details. An early bird is available for the event; register by the 28th September to receive a £100 discount on your booking. Registrations can be made on the event website.